There are generally two camps on Kevin Smith, the Jersey auteur and cult of personality behind Clerks, Dogma, Chasing Amy, and other foul-tongued provocations: Either you believe he’s the raw, honest, hilariously crude voice of the people, or you most emphatically do not. But few from either end of the divide would claim that Smith’s direction is his greatest strength; he may work well with actors, but “perfunctory” is the kindest word to describe his filmmaking chops. So the idea of a studio bringing in Smith as a director-for-hire makes about as much sense as the Yankees tapping CC Sabathia as a pinch-runner. With Cop Out, Smith works from a script other than his own for the first time—this one penned by siblings Mark and Robb Cullen—but his slack direction siphons the energy out of this tongue-in-cheek throwback to ’80s mismatched-buddy comedies. Any hope that the Cullens’ script might enforce a discipline Smith rarely exhibits on his own gets extinguished in the very first scene, when it becomes painfully apparent what Smith will be bringing to the table—improvisation, and lots of it. 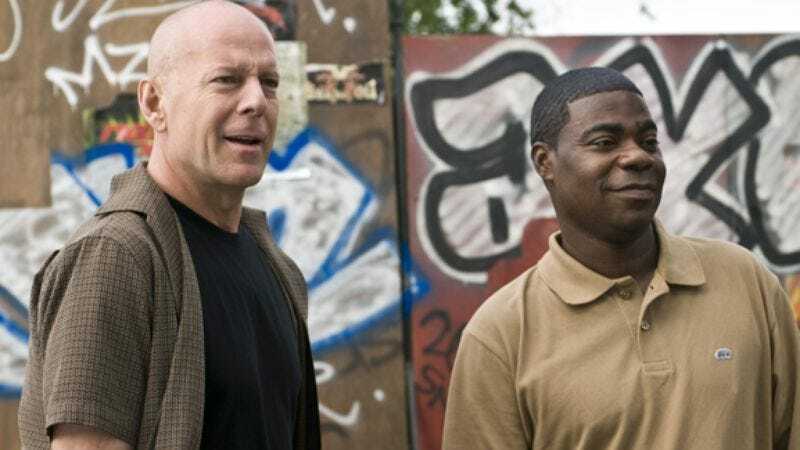 With their suspect in the interrogation room, Brooklyn detectives Bruce Willis and Tracy Morgan, partners for nine years (though with a chemistry that suggests they teamed up only yesterday), argue over who gets first crack at him. Morgan wins out and proceeds on an “homage”-based line of questioning that has him riffing wildly on characters from movies, from Al Pacino in Scarface to Oprah Winfrey in The Color Purple. Smith lurches from the strained unreality of scenes like that one into a needlessly soupy plot involving Willis’ efforts to retrieve a rare baseball card from a Mexican drug kingpin in order to pay for his daughter’s wedding.